The Japanese word manpo-kei literally translates to "10,000 steps meter." A few years back, my dad read an article about the Japanese trend where people wear pedometers to ensure they walk a healthy 10,000 steps per day, roughly five miles. Since then he's been pedometer obsessed, and when he visits me in New York, so am I. While I'm undeniably horrible at math, I do have a strange love of counting things (like days or years until or since, friendship lengths, and sheep), so as my dad and I traverse the city, I intermittently ask him how many steps we've taken and then challenge us to walk more. On our best days, we hit around 10 miles and, of course, stumble across new restaurants to add to our Greatest Hits list. 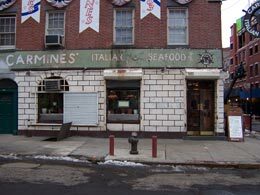 One such is Carmine's Italian Seafood, which is adjacent to the South Street Seaport. It's an ancient, grubby pub that immediately brings to mind the mariners (or should that be marinaras?) of yore. Just over a year ago (see, I'm counting!) I had the messiest meal of my life there: a whole lobster over angel hair, smothered in marinara. Dad will never forget my determination to conquer that plate. It was worth it just for the chuckles we still share over my mess. My hands and chin were smattered with red, but I ate that lobster, I did! We especially like their less messy pasta with clams. I haven't been since the Fulton Street Fish Market moved to Brooklyn, but I'm hopeful the clams are just as fresh as they were when the best seafood source in the city was located right across the street. After a walk in Central Park, my pa and I like eating at Josie's. I usually order the tofu salad with spinach, roasted veggies, chickpeas, and avocado and crumble some of their homemade cornbread in for extra texture. The Lemon Ribbon Ice Cream Pie is one of the best non-dairy slices you'll ever taste. It has lemon curd, meringue and some kind of dairy free delight. Josie's bills itself as "healthier new American cuisine," which in their case means no dairy, lots of organic and free-range fish and meat, and a large menu full of yummies that doesn't tip the scale. Recently we were strolling near the Brooklyn Promenade and noted that the Grimaldi's Pizzeria line was at its usual length: very long. I do like Grimaldi's, for the fresh basil and circles of mozzarella that crown each slice, but John's will always have my heart wrapped around his little pizza crust. Also in Dumbo is Five Front, owned by the folks behind Park Slope's 12th Street Bar & Grill. FF serves weekend brunch, has a $20 prix fixe for dinner M,W,F, and a serene back garden. Before walking the Brooklyn Bridge back to Manhattan (gotta get in those steps so we can eat more! ), I can't resist making a Water Street detour to grab a piece of chocolate or a spicy hot chocolate from the original Jacques Torres Chocolate shop on Water Street. Unfortunately for my dad, he doesn't particularly like chocolate (but give him a banana cream pie or a cheesecake from Carnegie Deli, and he'll go to town)! Just across the street, the Brooklyn Bridge Park has a little "beach," a fun looking playground and dog park, and great views of the underbelly of the Manhattan Bridge and of my favorite borough.